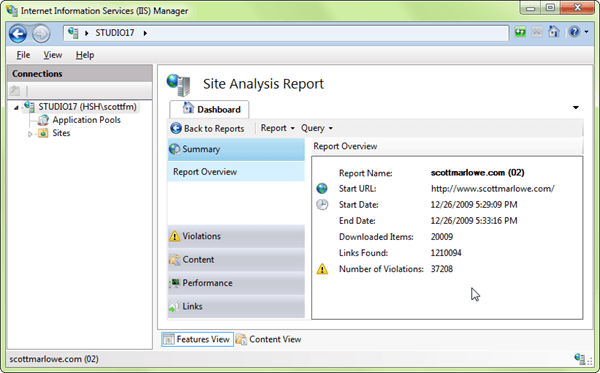 Scott Guthrie recently gave a shout-out to the IIS SEO Toolkit on his blog. I don’t know about you, but something about SEO always brings up thoughts of greasy salesmen and used cars. Best purge those preconceptions from your mind, though, cause SEO is important. 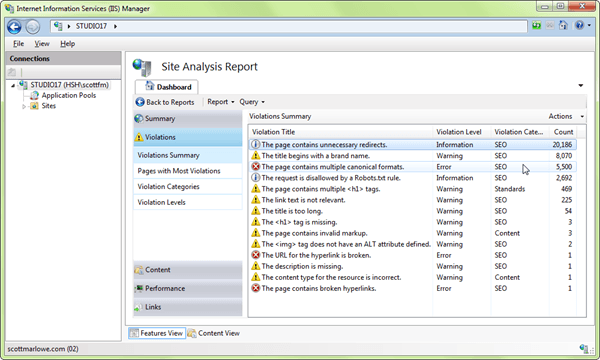 Even excepting SEO, the SEO Toolkit is a great way to find other issues with a web site. For example, large content files (such as images, which can probably be shrunk down), duplicate keywords, missing meta information, missing content, and other information will all be revealed once you run the Toolkit against your site. Scott gives a nice overview of the tool; I’ll let his discussion get you started and jump right into what the tool showed me. The statistic I’m most concerned with is the “Number of Violations”. I’ve got over 37,000 of them! Let’s take a look at the big ones (the ones with the highest counts). That should do it for that violation. Search engines often parse text so that words that appear earlier in a sentence are weighted higher than words that appear near the end of a sentence. Page relevancy is calculated by the use of important keywords that describe the page content. A page about a specific topic should use a keyword related to that topic at the beginning of the <title> tag instead of using a site name or brand name (“scottmarlowe”), because those do not describe the contents on the page. This one was easy to fix. I’d been using the format “scottmarlowe.com – <page name>” as the title of my document (web page), so based on the recommendation I simply flipped the title so it reads “<page name> – scottmarlowe.com”. The page with URL “http://www.scottmarlowe.com/category/Book-Reviews.aspx” can also be accessed by using URL “http://www.scottmarlowe.com/category/Book-Reviews.aspx?page=1”. Search engines identify unique pages by using URLs. When a single page can be accessed by using any one of multiple URLs, a search engine assumes that there are multiple unique pages. 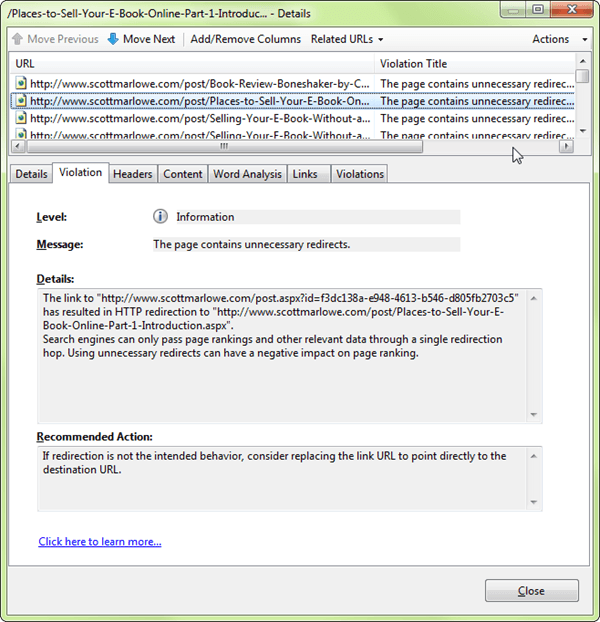 Use a single URL to reference a page to prevent dilution of page relevance. You can prevent dilution by following a standard URL format. This will prevent search bots from using other avenues to access a page they would have already indexed via the main url. This is the approach I took. Note that this is new and may not be supported by all search engines. This one was informational, and, in fact, was a non-issue as the pages excluded from crawling by my robots.txt were not supposed to be crawled. I realized I could live without the images on those particular posts so I simply deleted them from the pages where they were being used. This turned out to be a programming problem where many pages were having the meta description set twice. I corrected the code and hope to not see the violation again the next time I run the analysis. Turns out this is a known mishandling of meta information by the Toolkit and that there should be a fix released sometime soon. I’ll update this post once they do. Unfortunately this error prevented me from running any more analysis of my site, so I’ll have to wait until the fix is released to verify if I’ve fixed the major violations.